The WIRTSCHAFTSGEIST workshop brings together students of humanities, social and cultural sciences and the arts with social entrepreneurs. 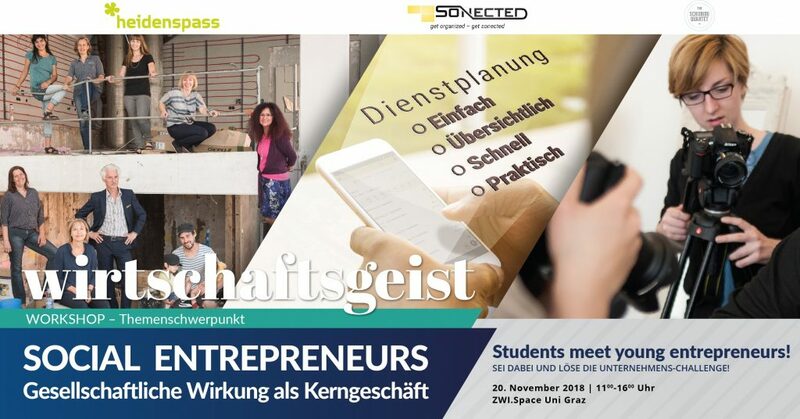 Students who are interested in working on social tasks with entrepreneurial approaches meet ambitious entrepreneurs to get to know each other and to work together on a challenge. The workshop creates a win-win situation for all parties involved: Students get insights into how social entrepreneurs tackle societal challenges, while companies get to know the diverse expertise of students in the humanities and arts and how they benefit from their creative problem-solving approaches. Each company gets together with an interdisciplinary group of students in order to work on a real-life challenge defined by the company. Approaches from different disciplines are combined while working on a predefined challenge. An innovation coach helps the teams with valuable input and creativity methods, in order to optimize the results. Date: Tuesday, November 20, 2018, 11.00 am to 4 pm.